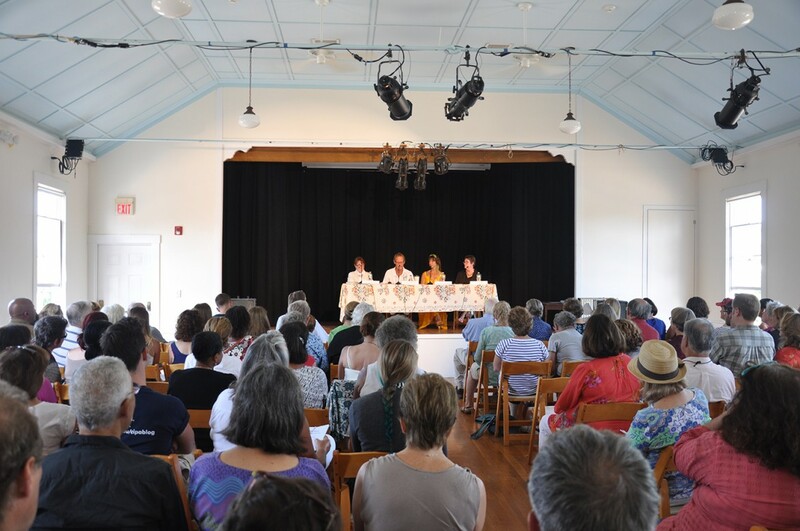 Hundreds of Martha’s Vineyard writers, readers, and literary fans trooped through the Grange Hall in West Tisbury on Monday to participate in Islanders Write, a daylong wordfest of panel discussions, free writing clinics, and book signings sponsored by The Martha’s Vineyard Times and MV Arts & Ideas magazine. M.V. Times owner Peter Oberfest, right, introduced author and historian David McCullough for his closing remarks. 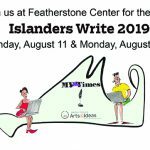 Peter Oberfest, publisher and owner of The Times, admitted to some flutters before the inaugural Islanders Write event. “I had this thought that I would show up and find about five people here,” he said. Not to worry. Nearly 70 people found their seats in the hall’s upstairs meeting room at the ungodly hour of 8 am to hear the first panelists discuss “Writing for Radio,” starring national PBS newsies Charlayne Hunter-Gault and Rob Rosenthal, and Mindy Todd and Sean Corcoran from WCAI, the Cape and Islands NPR affiliate, an event co-sponsor, along with Bunch of Grapes Bookstore and Edgartown Books. 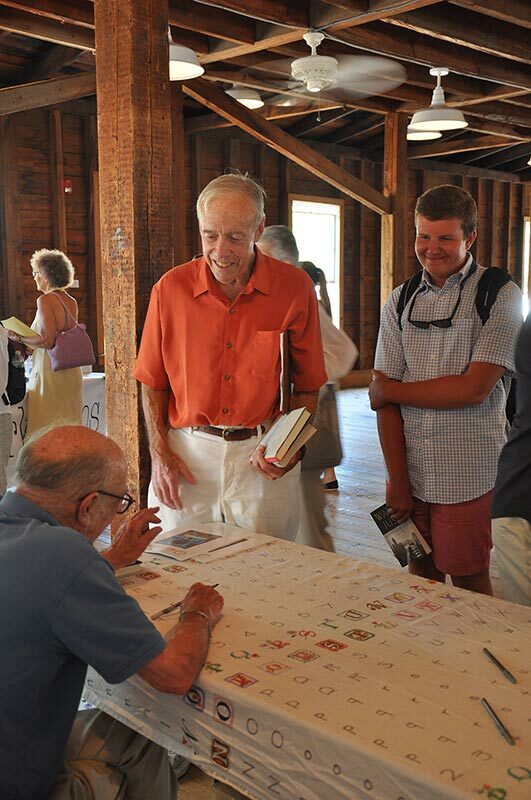 The Noepe Center for the Literary Arts in Edgartown sponsored Drop In and Write sessions for attendees. By midday, the panel discussion audiences were standing room only for discussions ranging from writing children’s books, writing in the new media world, narrative non-fiction writing, a discussion of writing workshop styles, and journalists who turn to fiction writing. 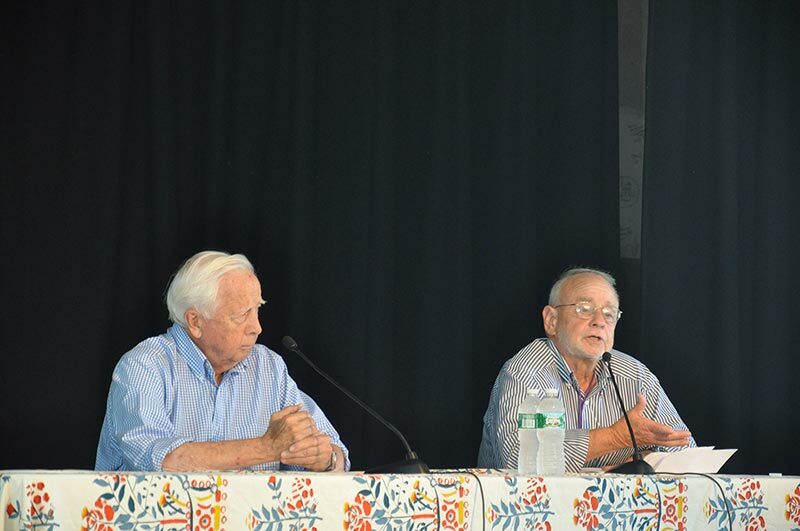 Mr. Oberfest and literary lion David McCullough delivered parting remarks shortly after 4 pm to a room with nearly 200 attendees, seated and standing. The mood in the hall was palpably upbeat and intent all day. The crowd no doubt enjoyed hearing from Pulitzer Prize winners (Mr. McCullough, Geraldine Brooks, and Tony Horwitz), but the 100-plus audience questions asked during the day indicated a genuine desire to learn more about the writing craft and, perhaps, some tips on getting published. A smattering of early careerists were there looking for the big break, and some fans showed up just because their favorite authors were speaking. 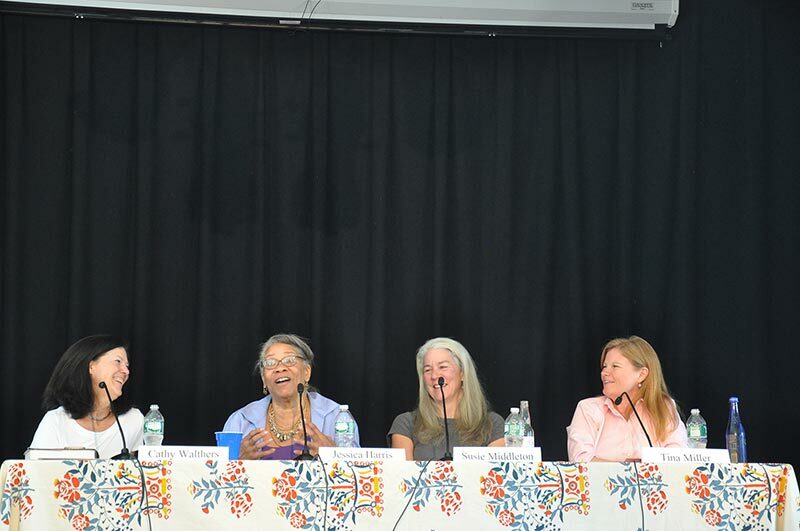 The cookbook authors panel consisted of, from left, Cathy Walthers, Jessica Harris, Susie Middleton, and Tina Miller. Panelist authors did a brisk business at the authors’ signing table downstairs close to the free writing workshops offered by Justen Ahren, director of the Noepe Center. “This is the best day in Noepe’s history,” Mr. Ahren murmured after eight non-stop hours of mentoring small groups of writers. What the audience got was advice on writing Ps and Qs and a somewhat grim recounting of the infernal thicket that book publishing has become from articulate pros who have been there. The role of research and its sometimes joyfully serendipitous results were touted by Mr. McCullough and by Joshua Horwitz, whose research for “War of the Whales: A True Story,” would uncover a world of deceit and secrets and pit him against the U.S. Navy whose sonar testing drills allegedly caused historically non-stranding whales species to strand in record numbers. The case is at the U.S. Supreme Court. For novelist Geraldine Brooks, research means something else. “I have to write enough first so the character has a voice and tells me what I need to know to tell the story. That’s when I learn what I have to find out,” she said, an example of a unique personal style urged by all panelists for attendees to develop. Panelist Ward Just converses with Ben Moore at the book signing table. “And don’t believe that it’s all been written about a subject. 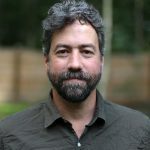 There is tremendous opportunity to uncover new information regardless of how many books have been written on a subject,” he said, bringing to mind John Hough Jr.’s new novel “Little Bighorn,” an event that has spawned hundreds of books and articles. A much anticipated panel featured Chilmarker Nancy Aronie and Mr. Hough, longtime mentors of writing groups using very divergent styles. Ms. Aronie requires only positive feedback for her writers from their colleagues, while Mr. Hough employs a more critical approach. Devotees of each style filled the room, applauding as their favorite was introduced. Ms. Aronie offered a quick summary of the differences. “[My approach] is don’t hurt the baby,” she said. “I teach the discipline of writing 10 minutes a day. My approach is to look for the remarkable, based on my own experience. If I had been criticized, I’d have gone swimming rather than writing. I want people to read aloud, to feel their own rhythm. Then you go to John to get the gold.” She noted that Mr. Hough’s students often bring work that is close to the publishing stage. Panelists were asked how to wrestle with the difficulty of publishing today, how to market and build audience with social media, the pros and cons of self-publishing, and what they described as the price gauntlet of online retailing. Amazon.com took an enthusiastic daylong beating from virtually every author. 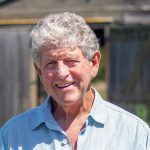 Tony Horwitz offered a complete and often humorous trashing of the online giant, saying Amazon’s price-slashing tactics are designed to put competition — publishing houses and independent bookstores — out of business, impoverishing authors in the process. He has decided to use the traditional publishing house model. “I’m going down with the Titanic,” he announced. 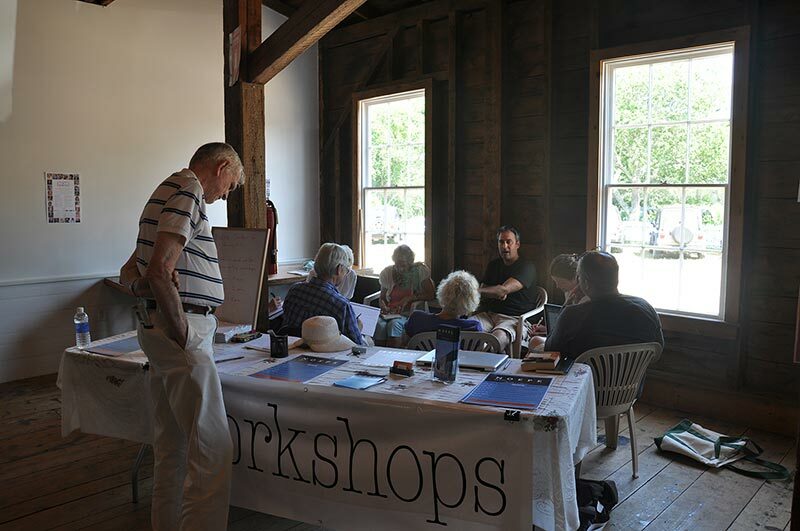 Justen Ahren (center, black shirt) of Noepe Center for Literary Arts ran writing workshops throughout the day. In addition to eight hours of sage advice, many attendees had positive experiences meeting and greeting each other. Tina Reich, a New Yorker with 27 summers on the Island with her husband Lou (a dead ringer for Robert De Niro) was over the moon to meet an MV Times book reviewer. And in the corner of the room, Deb Dunn, a children’s picture book author from Chilmark, was typing furiously on one of several electric typewriters set up for writers to use. “I used to have a Brother [brand] electric typewriter. I miss it,” she said. Across from her, college student Tanya Horwitz, 20, picked tentatively on an electric typewriter. “I may have used one once, maybe at my grandfather’s house. I wouldn’t want to use it for a long paper, but it’s kind of cool,” she said.